SSbD Travel was formed in 1998 by cousins Beverley Palmer (above, left) and Paula Brinkley. Paula speaks Khmer fluently and spends most of the year in Cambodia, which is now 'home from home'. Beverley runs the company's UK office, although over the past year she has spent a lot of time in Cambodia, researching and writing the first edition of the Rough Guide to Cambodia. SSbD is short for 'Same, Same, but Different', a response that is common when shopping in Asia, and the company operates from their offices in Trudoxhill, Somerset, UK. Beverley has travelled extensively around Southeast Asia, but her particular affection is for Cambodia. When not in Phnom Penh, she enjoys gardening at her cottage in Somerset. Beverley gave a slideshow presentation on the temples of Angkor. 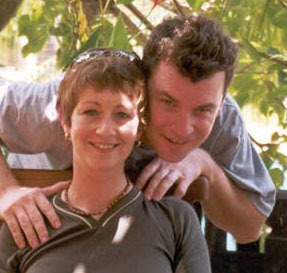 When retired doctors Liz and husband Tim arrived in Cambodia in 1991 to work with Voluntary Service Overseas, they faced a new and alien life, sometimes hilarious, sometimes tragic and shocking, but always unpredictable. Liz Anderson's moving story is told in her book, Red Lights and Green Lizards and both gave short presentations on their VSO experiences at the event. Liz, a GP and Tim, a consultant obstetrician and gynaecologist, have four children and five grandchildren. Anita has worked in the travel industry for 18 years, much of which was spent as a specialist on Southeast Asia for a UK travel company and then for an incoming tour operator in Vietnam. She's been travelling to the region regularly since the late 1980s and now works freelance, writing brochures and guidebooks and regularly leading tour groups to Vietnam and China. She has penned the revised 1999 Odyssey guide to Vietnam and the Bradt travel guide to Cambodia (2001) and talked about her early experiences in Cambodia in the late 1980s. Gill graduated from the London Hospital Medical College in 1990 and has had a varied career working as an expedition doctor in Africa with Raleigh International in 1993 and completed her training to be a GP in 1995. She first went to Phnom Penh in November 1996 as one of the original members of an international medical team with HOPE Worldwide. Their aim was to help establish what has now become a respected teaching hospital as well as centre of excellence for medical and surgical care in Cambodia. Whilst there she was given the responsibility for starting and developing the department for HIV/AIDS. She returned to London in March 2000, with her husband Dr Ferdinand Cruz (Philippines) who she had met and married in Cambodia. She's currently working as a GP in East Ham, London. Both Gill and her husband are on the Board of Directors for HOPE UK and she gave a short presentation on the work of the Sihanouk Hospital Center for HOPE in Phnom Penh. Giving an exhibition of classical Cambodian dance, Kaliane Bradley, who is also a ballet dancer, began learning classical Khmer dance two years ago with funding from national lottery sponsorship. At the Magic of Cambodia event, 14-year-old Kaliane performed the Wishing Dance, which took her nearly a year to perfect, a dance generally performed at the time of Bonn Chaul Chhnam (the Khmer New Year in April) and other major celebrations. The aim of The Cambodia Trust is to help people with disability regain their mobility, dignity and self-sufficiency, so they can lead full and productive lives as part of the community. Their work has already made a huge impact. But theres so much more still to be done. Step by step, with the public's help, they are making a real difference. Find out a lot more about their work at http://www.cambodiatrust.org.uk/. One of the strongest needs in modern Cambodian society is the education of girls. As you may know, boys receive preferential treatment in most families and often its the girls who miss out. This charity is small but is making a real difference for a handful of girls (14 at the last count with another 20 waiting in the wings) in Phnom Penh and Mondulkiri province by providing genuine support for their education. If anybody wishes to contribute money to the foundation, it is tax-deductable in the United States (as a non-profit organization). You can contribute or obtain more information by contacting Peter Leth in Cambodia (pleth@lycos.com) or Frederick Lipp in the US (fredericklipp@msn.com). Frederick Lipp is the author of the illustrated children's story book, 'The Caged Birds of Phnom Penh'. Find out more about their work at http://andybrouwer.co.uk/casf.html. His Majesty King Norodom Sihanouk has received your message informing His Majesty that on Saturday 17th August 2002, you will organize an event in Oxford focusing on the positive aspects of Cambodia, its people and its culture. His Majesty the King expresses His deep gratitude to you for taking a great interest in Cambodia and its people, and His best wishes for the success of your noble endeavour. The Cabinet of His Majesty Preah Bat Samdech Preah NORODOM SIHANOUK, King of Cambodia, Phnom Penh. Congratulations on your forthcoming celebration - The Magic of Cambodia. It's a big undertaking, especially considering that you've put it together in your free time and simply out of your genuine love for the country and its people. The programme is varied and caters to a broad range of interests. There's something for everyone - those who have been to Cambodia, those who want to go to Cambodia and those who just would like to know more about Cambodia. I applaud you for you efforts and only regret that I cannot attend. Sending you my very best wishes for a successful and rewarding celebration. Dawn F Rooney, author of 'Angkor - An introduction to the temples'. The idea for a conference on Cambodia sounds fabulous. Again, thanks for all your support and great work to help Cambodia. Loung Ung, spokesperson for the Campaign for a Landmine Free World & author of 'First They Killed My Father - A Daughter of Cambodia Remembers'. Many thanks for organizing such an important event for Cambodia. While I agree that you made a point about the 'negative light' by the world press, I must say that the world press have played a very important part for Cambodia in keeping the world informed on what really happened in Cambodia and what Cambodia really needs. The world press has been an effective messenger for Cambodia. To me, Cambodia is always the gentle land. And Cambodians are always the gentle people. The press cannot change this fact. Youk Chhang, Director, Documentation Center of Cambodia. Good of you to ask me to your celebration. I've never been to Cambodia but spent thousands of hours there inside my head. I probably only ever 'saw' the terrible side of what I know is one of the most beautiful countries on earth. I was privileged to hear Dith Pran talk at the NFT almost 20 years ago, and that night I cried again for Cambodia. I've never been so moved as when he talked of "my country, my country." It is a good thing to know the country is healing and I send you all sincere wishes for all you are doing. Bruce Robinson, actor, director and screenplay author of the 1984 film 'The Killing Fields'. I admire you for organizing this event for Cambodia people. Thanks a lot for your interest in Cambodia and please give my regards to the Khmer community in Britain. ADHOC (Cambodia Human Rights & Development Association, Phnom Penh).